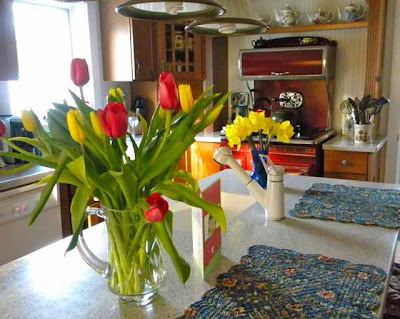 I love having fresh flowers on the dining room table and on the kitchen counter. With this in mind, I grew a wider variety of plants for cutting this year. I always grow zinnias and marigolds from seed and incorporate them into my vegetable garden. 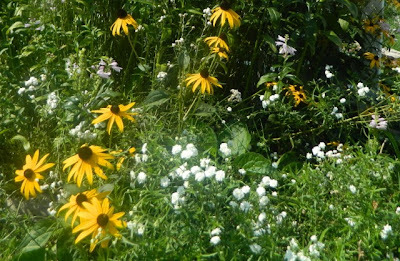 In addition, my 2013 garden included a new bed of annuals (I wrote about it here.) 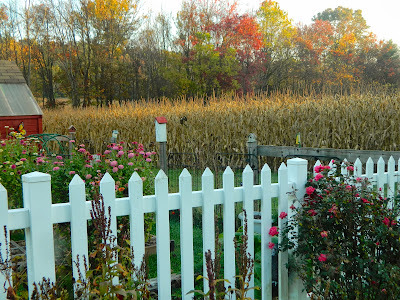 Now that the growing season is over, and all my blooms are zapped by frost, H.H. is clearing the beds, giving me the incentive to plan my plantings for next year. 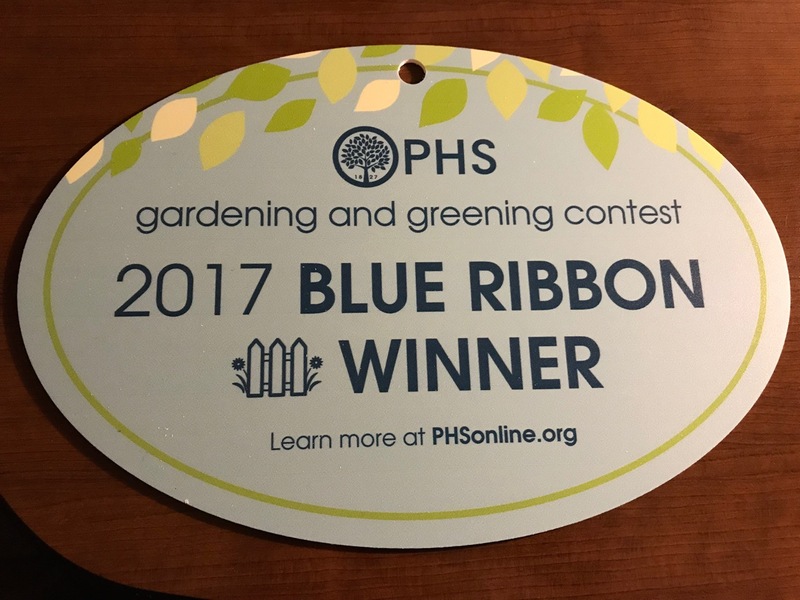 I tend to associate cutting gardens with annual flowers, but many perennials and woody ornamentals work well for cutting. 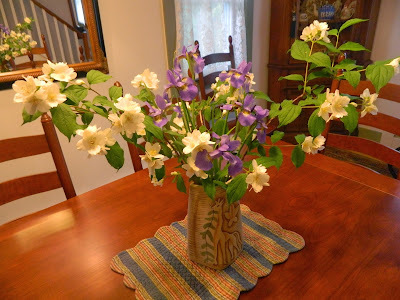 As a rule of thumb, I choose flowers that have long, sturdy stems and blooms that last a long time once cut. I also like to include fragrant blossoms in my bouquets -- scent is often missing from store-bought flowers. 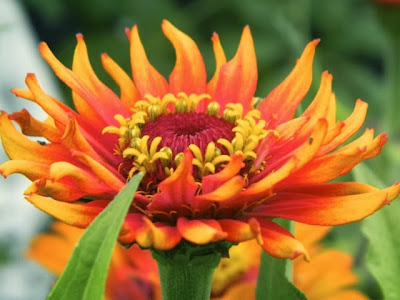 I can't better White Flower Farms Catalog description of Zinnia 'Zowei! Yellow Flame' (my favorite variety this year.) 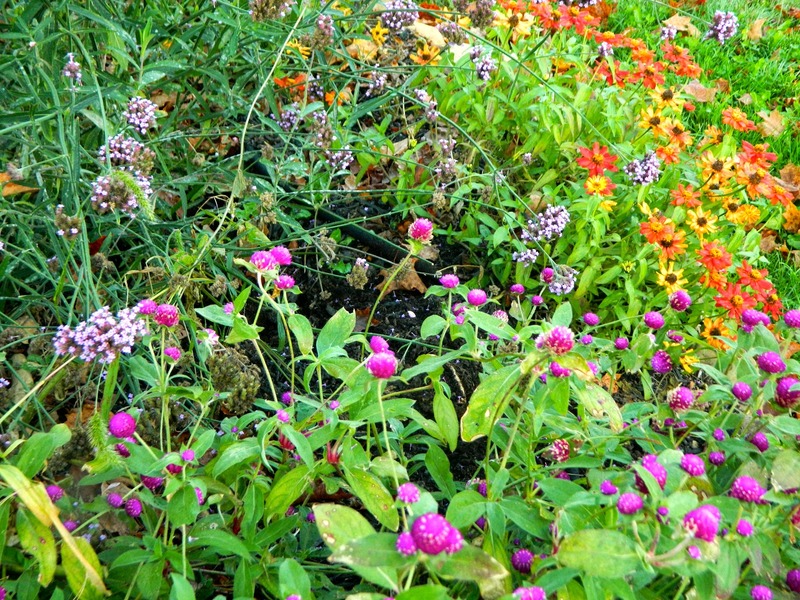 -- "Nothing ignites a bed or mixed border like a mass planting of Zowie! Its brilliant, yellow-tipped petals start off magenta-pink then turn to scarlet-rose around a dramatic red-and-yellow cone. 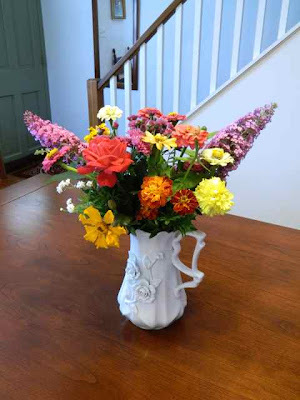 The blooms measure about 3in across and are superb in bouquets. An All-America Selections Winner for 2006." 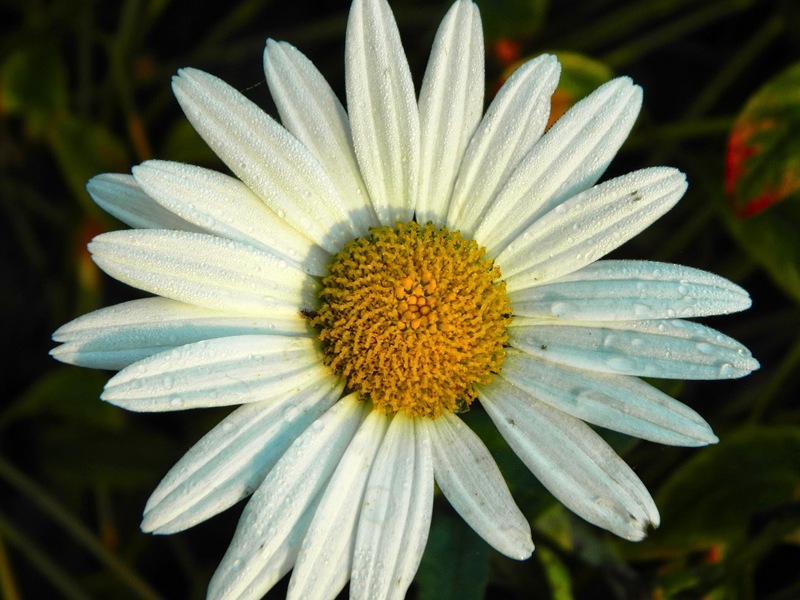 Shasta daisy (Leucanthemum x superbum) is an ideal cut flower for its sturdy stems and long vase life. Its white petals provide some calm among the zinnias and other bright colored blooms I love. This perennial is an old-time favorite for the summer, cottage garden. 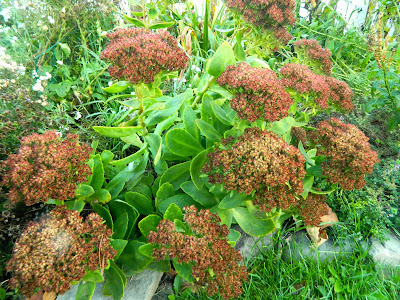 They bloom from July to September, requiring only good, rich soil and lots of sun. Globe amaranth (Gomphrena globosa) is a prolific bloomer that lasts until frost. This annual has clover-like blooms that add fun to any flower arrangement. I planted Gomphrena globosa 'QIS Purple' and it proved to be very prolific and reliable. Globe amaranth is very tolerant of heat and humidity and doesn't need special growing requirements. Gomphrena means "everlasting" in Latin and these flowers are wonderful in dried arrangements. The small perennial sunflower, Helianthus microcephalus, is perfect for flower arrangements. 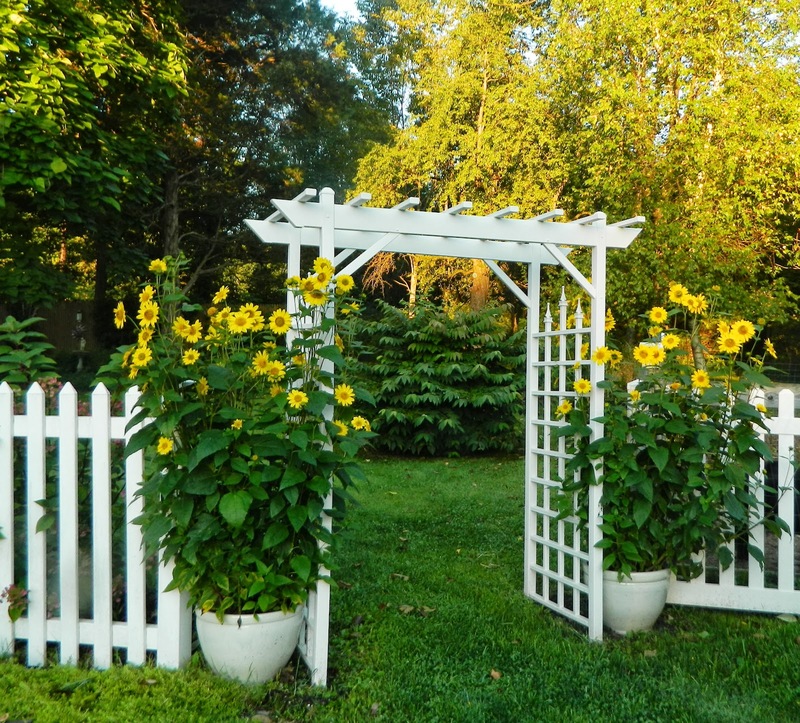 With its cheerful yellow flowers, it is my favorite of the native sunflowers. I like to add the excellent fine textured foliage to my arrangements. Followers of this blog have heard me say that I grow this perennial in containers because it tends to be aggressive. 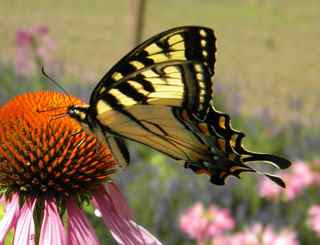 Purple cone flower, Echinacea purpurea, is valued for its large sturdy daisylike flowers with drooping petals. 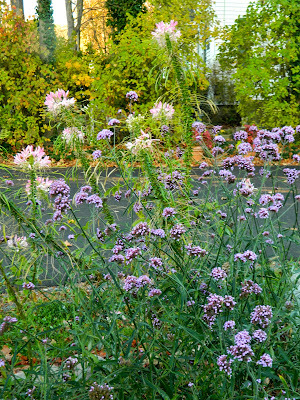 This prairie native will spread easily in good soil and full sun. Few pests or diseases bother it, and it is a reliable cut flower -- I bring in armloads of it to brighten the house. Birds and butterflies love it. I let the flowers go to seed and the goldfinches come to feast on the seeds daily. 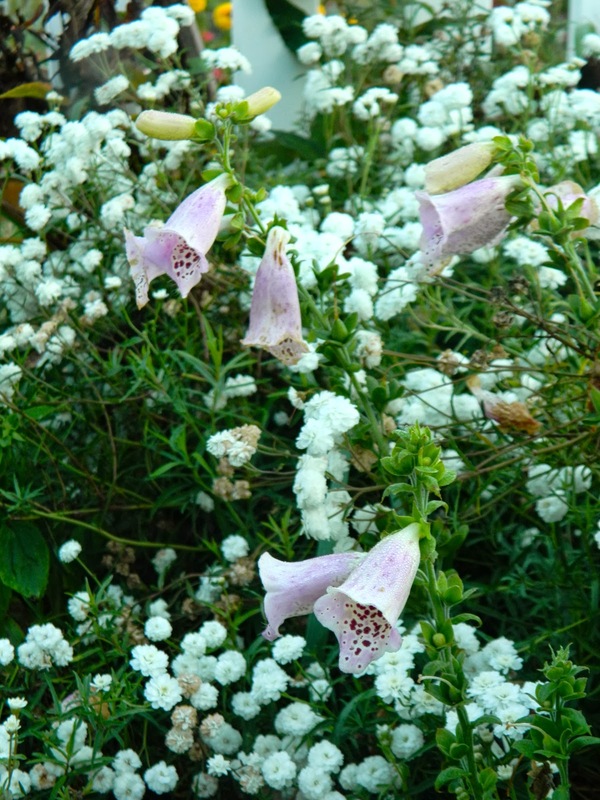 Rosy purple or white were once the only choices in flower color. 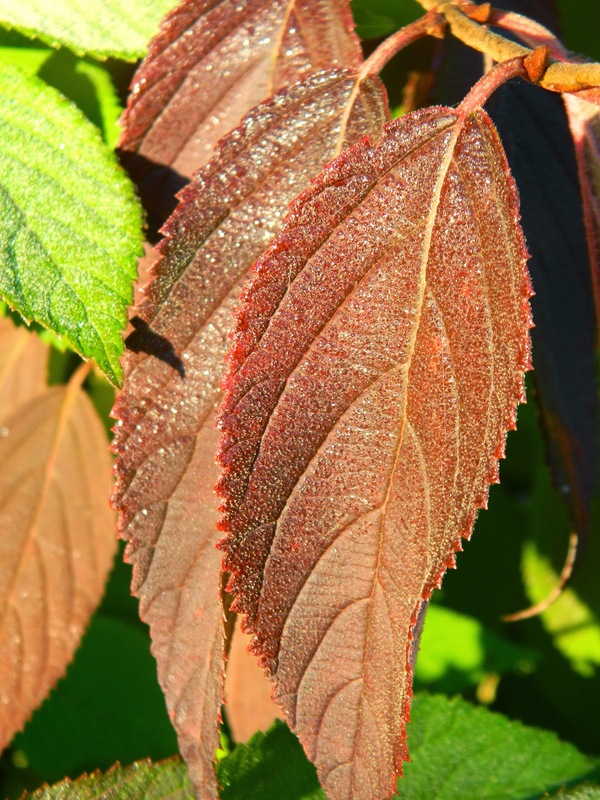 Recent hybrids have introduced yellow, orange, burgundy, cream, and shades in between. There are many other flowers you can choose for your cutting garden: annuals such as sweet peas, calendula, celosia, larkspur, nigella, cosmos and salvia. 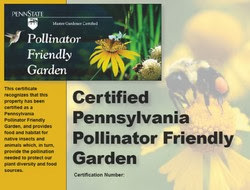 Perennials such as rudbeckia, Joe Pye weed, coralbells, campanula, yarrow, agstache, lavender, veronica, tulips, daffodils and lily of the valley. My favorite flowering shrubs for arrangements are viburnum, forsythia, and mock orange. 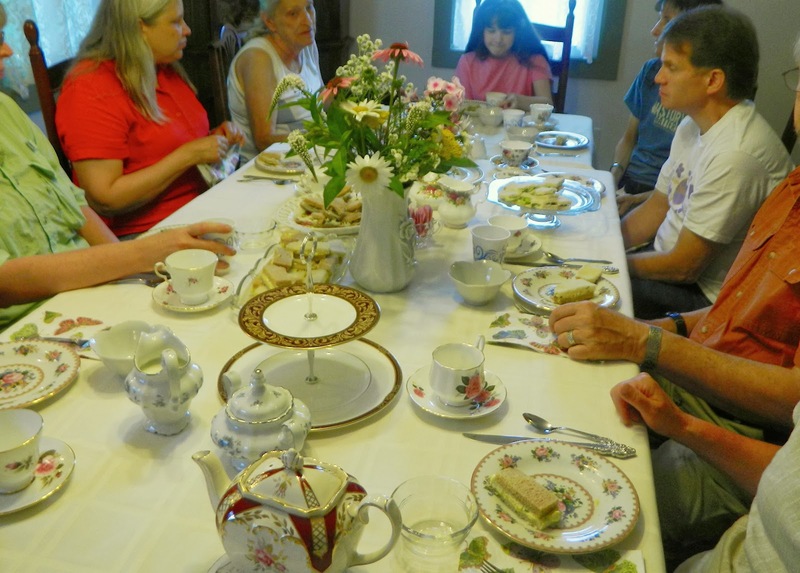 Rudbeckia and Yarrow 'The pearl"
When friends come for an English tea, I always have fresh flowers on the table. 1. 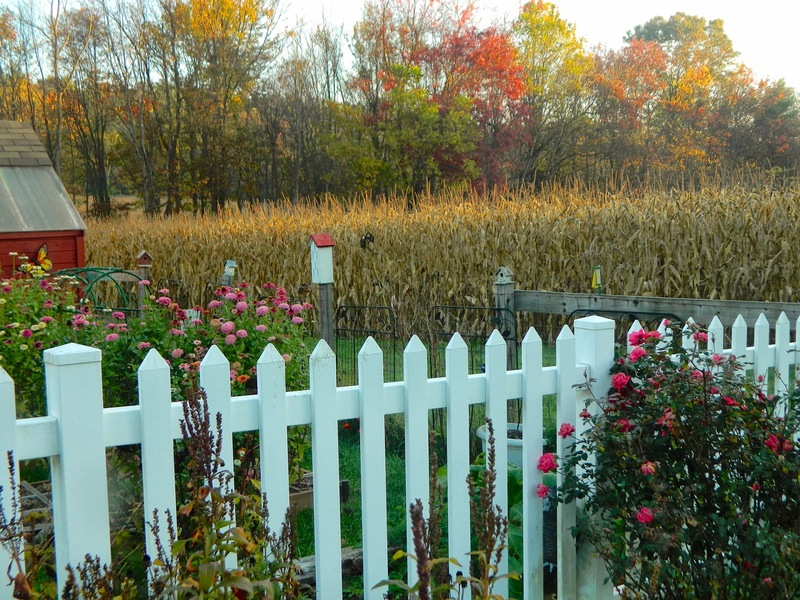 Be sure your plants are growing in good soil -- test and amend as needed. I apply an annual application of organic matter. 2. Be sure the growing plants receive sufficient water. I use a soaker hose in each bed to water the roots and minimize disease and rot problems. 3. 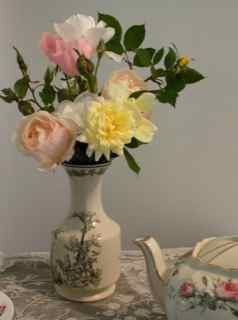 Harvest each flower when buds are just starting to open, or flowers have recently opened, and put the cut stems in tepid water right away. 4. 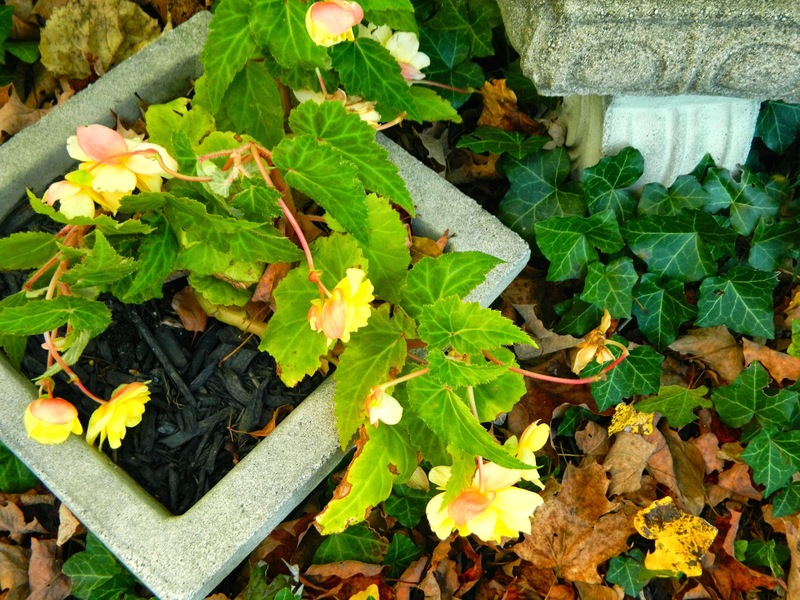 Strip off the leaves, thorns, or other plant material -- if left submerged this plant tissue will decay and shorten the life of your arrangement. 5. Use clean water in your vase. 6. Re-cut each stem prior to placing it in the vase. Cut off approximately 1/2 inch of the bottom of the stem under water in a bowl in the sink, and immediately place it in the vase. 7. Check the water level daily and replace every few days. 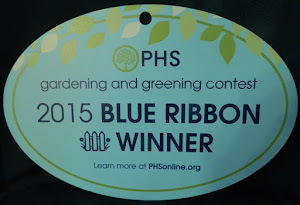 While recovery from my recent illness is slow, and I can't work outside, I am able to plan next year's garden. 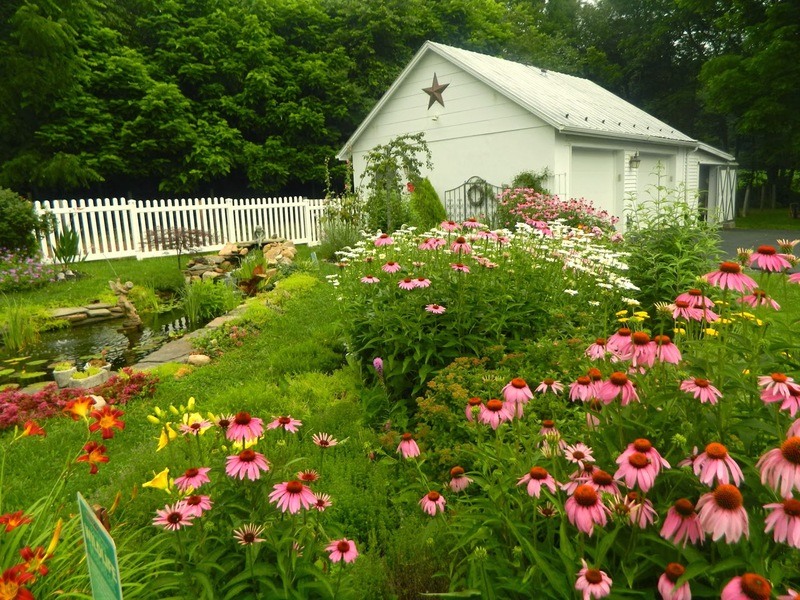 Have you started planning for the next gardening season? Thank you, for all your kind wishes and prayers for the return of my good health! 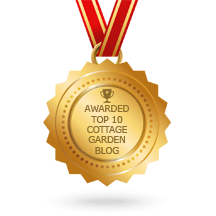 Garden bloggers are the best of friends! 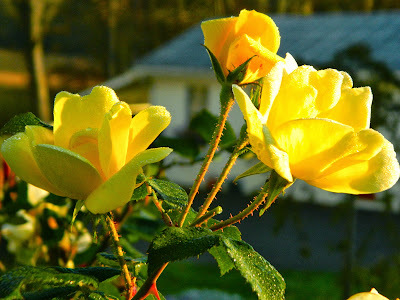 The heady fragrance of roses. Life is perfect only rarely and briefly, and gardens are the same. If I am to keep my sanity I have to let go of perfectionism. I've said that before, but of all the lessons the garden has taught me, this is the hardest for me to accept. I haven't gardened since last Bloom Day due to a debilitating illness with 4 days in the hospital. 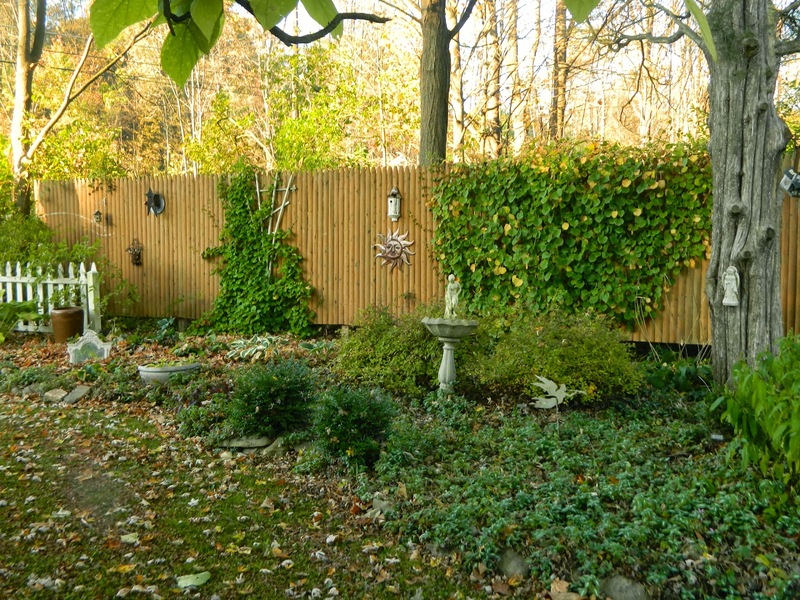 This morning, I walked (wobbled) around my garden and was horrified at its look of neglect: Japanese stilt grass, dead blooms and foliage, Japanese stilt grass, broken shrubs, mounds of leaves, Japanese stilt grass, and perennials that need dividing. Oh, and did I mention the Japanese stilt grass? And to make matters worse -- I know I have missed several weeks of lovely weather! 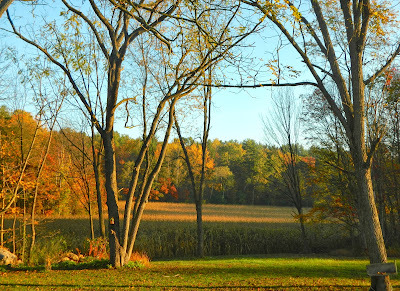 The corn in the lower field is ready for cutting. The Yarrow 'Autumn Joy' has turned a yummy caramel brown. 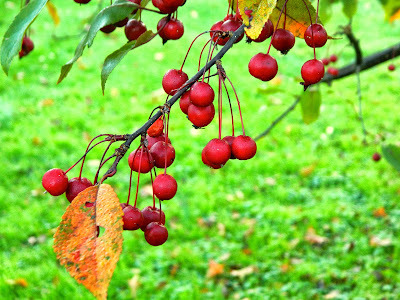 The crabapple tree is loaded with berries. 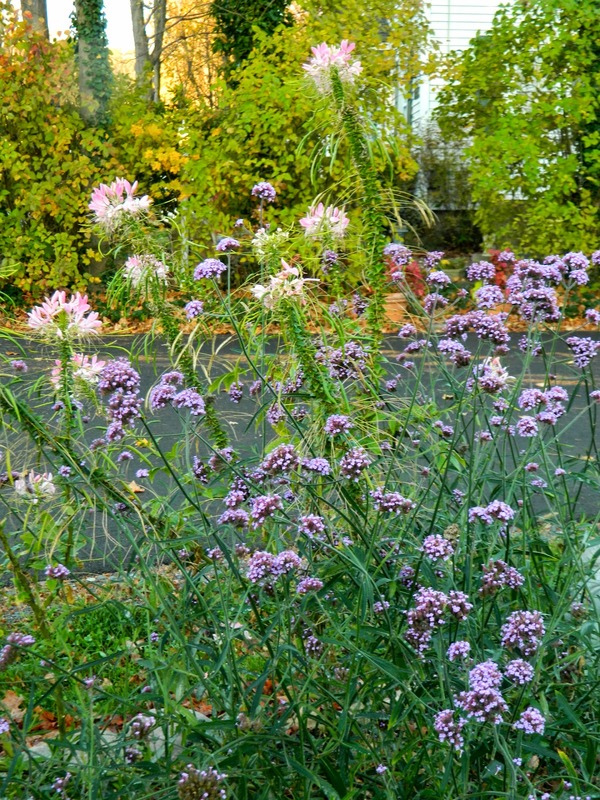 Tall Verbena blossoms are even more abundant. 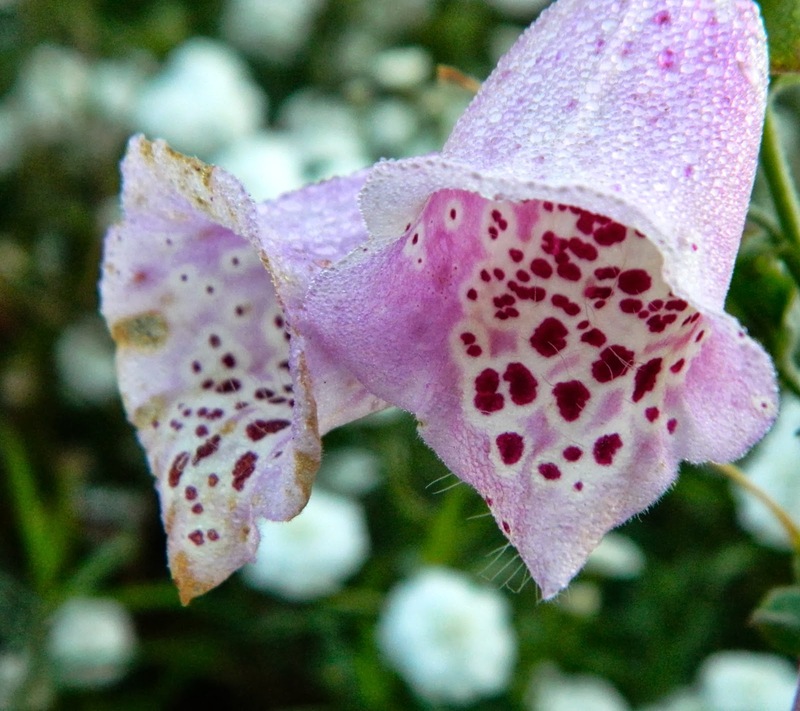 Foxgloves and Yarrow 'The Pearl' are everywhere. Shasta Daisy is smiling again. A breathtaking last flush of roses. 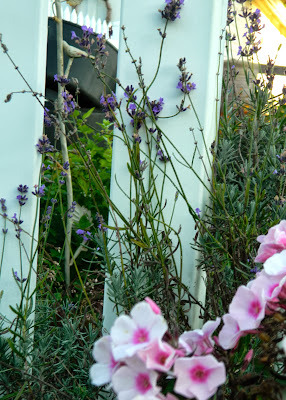 Lavendar and Phlox are a surprise. 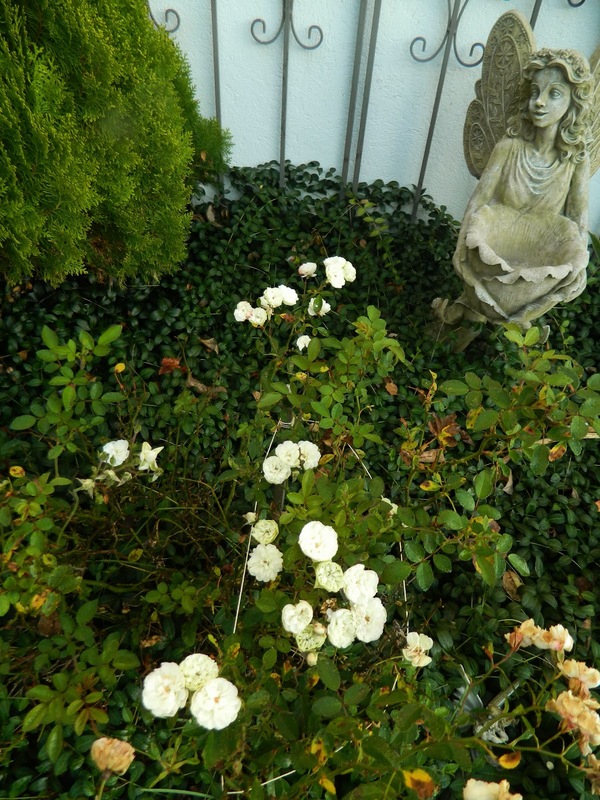 Miniature white rose is full of pretty blooms. This is begonia is one of several planters in the stone garden still blooming. 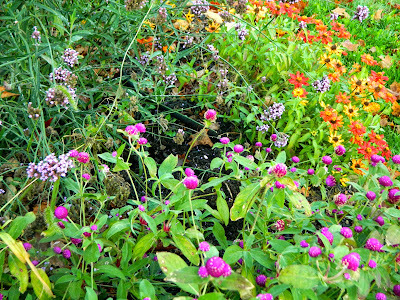 A glorious mass of Zinnia and globe amaranth. 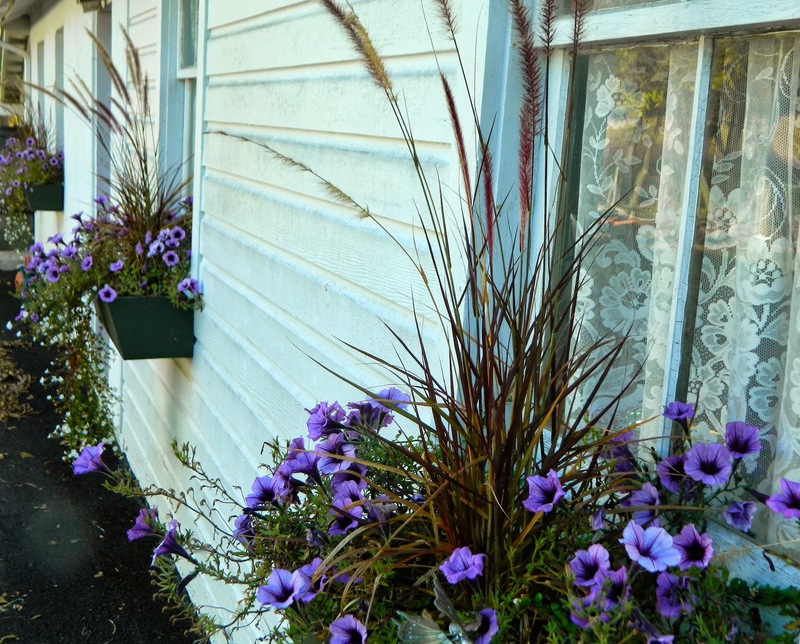 Petunias, purple fountain grass, and bacoba continue to flourish in my 5 window boxes. The first picture on this posting is of our top field and is the view from my kitchen window. Yes, I am truly blessed to live with such beauty! So while I wish my garden was free from flaws, I will try very hard to accept its imperfections and focus on all its loveliness. I resolve to let go of perfectionism! I'm linking with Carole at May Dreams Gardens for everyone's favorite meme, Garden Bloggers' Bloom Day. Sorry no botanical names on my photos today and no touch-ups. 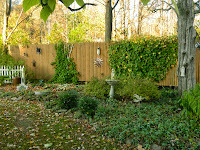 The shade garden looking messy.